A number of respondents to my remarks on Arundhati Roy's Capitalism: A Ghost Story (see previous post) have accused me of not seeing the forest for the trees. No matter this or that error or mistaken detail, they say, her larger, abstract argument is valid. NGOs and charitable foundations have agendas (Hate using that word since, pedantically, agenda is plural of agendum, but 'NGOs have agenda' will come across as a typo. I have sworn, however, never to use criteria as a singular noun.) that are commonly determined by sponsors who are commonly anonymous and commonly fronts for governments. I have no problem accepting the thesis outlined above, and neither, I believe, will anybody else reading it. It is verifiably, demonstrably true, but it is not what Arundhati Roy is claiming. She tries to knit a grand conspiracy in which governments, businesses and NGOs efficiently combine to serve the cause of Capital and Empire. The small errors in her argument are important because it is through these that she tries to weave in the ends of the fabric, and tugging at them causes the entire pattern to fall apart. The era of the Privatisation of Everything has made the Indian economy one of the fastest growing in the world. However, like any good old-fashioned colony, one of its main exports is its minerals. India’s new mega-corporations—Tatas, Jindals, Essar, Reliance, Sterlite—are those who have managed to muscle their way to the head of the spigot that is spewing money extracted from deep inside the earth. Are minerals among India's main exports? The mining sector contributes only between 2 and 3% of GDP, so it's hardly central to the economy. Not quite what sugar was to the Caribbean or oil is to West Asia. We exported 128,000 crore rupees worth of minerals in 2009-10, and our total exports that year amounted to 845,000 crore rupees. OK, you say, that's a substantial percentage of total exports, but there's a catch. The biggest item in that export list is of diamonds, at 85,000 crore rupees. We also imported uncut diamonds worth 75,000 crore, and the same were then exported after being cut and polished. So, the export of minerals actually mined in India was a paltry 43,000 crore rupees, of which 28,000 crore rupees was iron ore. The second largest mineral export was granite at 5,000 crore rupees. We imported 525,000 crore rupees worth of minerals in the same year, of which crude took a massive slice. But even leaving petroleum aside, India was comfortably a net importer of minerals, with coal and copper being our biggest buys. Now, does that still resemble "any good old-fashioned colony"? Meanwhile, in the latest recorded year, India exported 290,000 crore rupees worth of software services, equaling nearly seven times our minerals exports (minus those re-exported diamonds) of 43,000 crore rupees. So much for us being a colony exploited for its raw materials. Not that today's major commodity exporters are akin to colonies in any case. Do Qatar, Russia, Australia, South Africa and Argentina seem like colonies to an impartial observer? Roy hints at a widely accepted story about the economics of colonialism, a story told by my school history books and one seemingly accepted by Left, Right and Centre in Indian politics. It goes like this: India was a land famed for its artisans and manufacturing skills. The British discouraged indigenous Indian manufacturing and turned this country into a supplier of raw materials and a market for British finished goods. The textile industry is the paradigmatic example of this process: India's long-standing position as a world leader was undermined by imperial restrictions on sales, cotton was shipped from India to Lancashire and other British factory towns, and finished cloth produced in those places sold back to India. It was the British intruder who broke up the Indian hand-loom and destroyed the spinning-wheel. England began with driving the Indian cottons from the European market; it then introduced twist into Hindostan, and in the end inundated the very mother country of cotton with cottons. From 1818 to 1836 the export of twist from Great Britain to India rose in the proportion of 1 to 5,200. In 1824 the export of British muslins to India hardly amounted to 1,000,000 yards, while in 1837 it surpassed 64,000,000 of yards. But at the same time the population of Dacca decreased from 150,000 inhabitants to 20,000. This decline of Indian towns celebrated for their fabrics was by no means the worst consequence. British steam and science uprooted, over the whole surface of Hindostan, the union between agriculture and manufacturing industry. 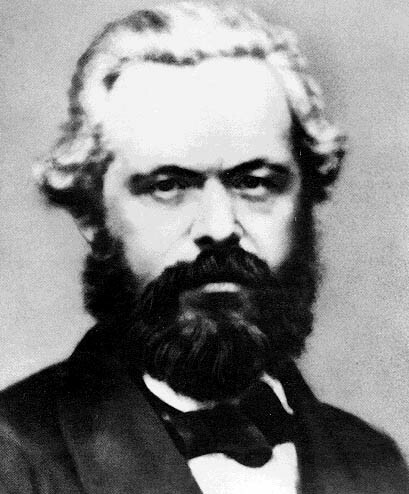 Marx saw, as early as 1853, an emerging contradiction within Britain with respect to India. The extract below is long, but worth reading carefully, for it contains an analysis that has eluded most post-colonialists, and resulted in a skewed view not only of imperialism but of the relationship between Empire and Capital. During the whole course of the 18th century the treasures transported from India to England were gained much less by comparatively insignificant commerce, than by the direct exploitation of that country, and by the colossal fortunes there extorted and transmitted to England. After the opening of the trade in 1813 the commerce with India more than trebled in a very short time. But this was not all. The whole character of the trade was changed. Till 1813 India had been chiefly an exporting country, while it now became an importing one; and in such a quick progression, that already in 1823 the rate of exchange, which had generally been 2/6 per rupee, sunk down to 2/ per rupee. India, the great workshop of cotton manufacture for the world, since immemorial times, became now inundated with English twists and cotton stuffs. After its own produce had been excluded from England, or only admitted on the most cruel terms, British manufactures were poured into it at a small and merely nominal duty, to the ruin of the native cotton fabrics once so celebrated. In 1780 the value of British produce and manufactures amounted only to £386;152, the bullion exported during the same year to £15,041, the total value of exports during 1780 being £12,648,616, so that the India trade amounted to only 1-32 of the entire foreign trade. In 1850 the total exports to India from Great Britain and Ireland were £8,024,000, of which cotton goods alone amounted to £5,220,000, so that it reached more than 1/8 of the whole export, and more than 1/4 of the foreign cotton trade. But the cotton manufacture also employed now 1/8 of the population of Britain, and contributed 1/12th of the whole national revenue. After each commercial crisis the East Indian trade grew of more paramount importance for the British cotton manufacturers, and the East India Continent became actually their best market. At the same rate at which the cotton manufactures became of vital interest for the whole social frame of Great Britain, East India became of vital interest for the British cotton manufacture. Till then the interests of the moneyocracy which had converted India into its landed estates, of the oligarchy who had conquered it by their armies, and of the millocracy who had inundated it with their fabrics, had gone hand in hand. But the more the industrial interest became dependent on the Indian market, the more it fell the necessity of creating fresh productive powers in India, after having ruined her native industry. You cannot continue to inundate a country with your manufactures, unless you enable it to give you some produce in return. The industrial interest found that their trade declined instead of increasing. For the four years ending with 1846, the imports to India from Great Britain were to the amount of 261 million rupees; for the four years ending 1850 they were only 253 millions, while the exports for the former period 274 millions of rupees, and for the latter period 254 millions. They found out that the power of consuming their goods was contracted in India to the lowest possible point, that the consumption of their manufactures by the British West Indies, was of the value of about 14s. per head of the population per annum, by Chile, of 9s. 3d., by Brazil, of 6s. 5d., by Cuba, of 6s. 2d., by Peru, of 5s. 7d., by Central America, of 10d., while it amounted in India only to about 9d... Besides, they found that in all attempts to apply capital to India they met with impediments and chicanery on the part of the India authorities. Thus India became the battle-field in the contest of the industrial interest on the one side, and of the moneyocracy and oligarchy on the other. The manufacturers, conscious of their ascendancy in England, ask now for the annihilation of these antagonistic powers in India, for the destruction of the whole ancient fabric of Indian government, and for the final eclipse of the East India Company. It's so obvious in retrospect, but till I read this passage in my late teens, I had swallowed the official story about the Raj lock, stock and barrel. If a nation's citizens are progressively impoverished, and the nation becomes merely a place to grow or dig out raw material to be exported for manufacture elsewhere, that nation and its citizens cannot simultaneously provide a flourishing market for finished goods. You cannot continue to inundate a country with your manufactures, unless you enable it to give you some produce in return. Across the world as the 'free market' brazenly protects Western markets and forces developing countries to lift their trade barriers, the poor are getting poorer and the rich richer. I have confronted this idea from a different perspective in an earlier blog post, but in the present context I want to underline the inherent contradiction within it, which Karl Marx's 159 year-old newspaper column exposes: if the poor keep getting poorer, lifting trade barriers is useless, since people on the other side of the divide will be incapable of buying any goods from those nasty Western neo-imperialists. The chief problem with Roy's article is that it's a piece of bad journalism. She tailors details to fit her convictions, which are watertight and absolute. Of course corporations, governments and NGOs have agendas. But in weaving together this narrative of conspiracy, Roy commits the fallacy of reification. Her painstakingly long piece is ultimately a piece of lazy journalism because it operates only at the level of ideas. Where are the facts? And how substantial are the details that she has presented? However Girish, while your point about capitalism generating wealth is something that Roy should have addressed, it's simplistic to let it be at that. While the free market does generate wealth even for the poor, it comes at a huge price - exploitative labour practices for example. Middle class Chinese might be able to afford Apple products. But that is made possible by people working over 60 hours a week in terrible conditions, large scale displacements for 'development' projects that leave thousands poor and so on. In annotating Roy, I left out my own viewpoints on the relevant issues, and it was probably a mistake to make it such a narrow rebuttal. I've criticised belief in free markets in other posts and in my Yahoo column. China, however, is not an exemplar of the free market. The displacements you speak of are usually for government-mandated and often government-run projects like the 3 Gorges dam. Millions of people were displaced for development projects in India long before the era of liberalisation. Again, don't read this as a defence of laissez faire. I personally have read very little of Arundhati's writing, so will not say anything on that. But I do wanted to share something i am trying to understand and feel relevant here; which is that perhaps getting an understanding of 'capital movement' is now more important then ever. When the world is now in domino position. There may not be a grand scheme in place to rule the world but there certainly is a scheme to keep capital moving ever more freely through invisible hands. And pioneers of well known foundations were involved in encouraging, cementing, supporting this very idea. And today when one thing goes wrong in one place the rest of world keeps guessing what went wrong and at the end average citizen ends up taking the brunt of the mess. Still lot of careful study required for me to really put concrete examples but network of tax havens and who controls them just might be a good beginning to study this. I just wanted to put something out there, which has taken my attention lately. Thanks for sharing your thoughts, Vijay.